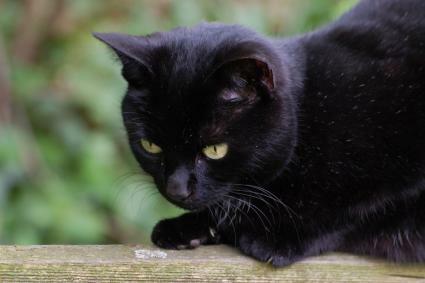 As the subject of feline folklore and superstition, myths about black cats abound. Whether or not you believe these dark-colored kitties are bad luck, you can't deny their charm and beauty. Black Cats: Good Luck or Bad? Black cats are highly mysterious creatures. The Committee for Skeptical Inquiry has written considerably regarding the cultural superstitions that surround black cats. The views surrounding these felines are often contradictory, almost to an amusing degree. For example, in Britain or Japan, having a black cat cross your path is associated with future good fortune. In contrast, citizens of Europe or the United States view this occurrence as an ill-omen. How Long Do Calico Cats Live? Up until the 17th century, many cultures such as Egypt and Rome deified cats. In Egypt, the death of a cat was equated to the death of a family member. Cats were mummified, and families wept and mourned as for a human counterpart. Things went sour for cats by the 1600s when felines became associated with witchcraft. In fact, many households burned cats on Shrove Tuesday as a means to protect the family from natural disasters and calamitous events. Superstitions regarding black cats remain active today. 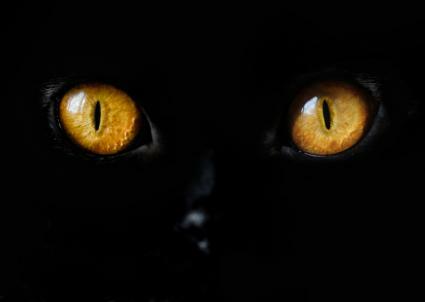 An article hosted by TheCatSite.com helps unveil the precise origins of black cat superstition. The view of black cats being favorable creatures is attributed specifically to the Egyptian goddess Bast (or Bastet), the cat goddess. As an honor to Bast, Egyptian households believed they could gain favor from Bastet by hosting black cats in their household. This view apparently was held in the early 17th century by the English monarch Charles I. Upon the death of his treasured pet black cat, he is said to have lamented that his luck was gone. True to his claim, he was arrested the very next day and charged with high treason. Many cultures maintained similar views regarding black cats as luck bringers. However, it was ultimately the Puritan's belief that black cats were the companions of witches that reversed such views in early colonial America. Black is a very attractive color for cats. The deep single-toned black color can highlight the shine of a feline's coat. The stark contrast between a cat's eyes and its black coat color also serves to make this animal all the more striking. Black cats are not an actual breed in their own right, although many breeds can produce a black coat. The breed associated with this coat color will also determine factors such as eye color and coat lengths. A long-haired black cat, such as the Persian, can offer an entirely different appeal than a sleek black Bombay. Likewise, the teddy bear coat and frame of a British Shorthair will make the black coat color seem far more charming than insidious. Truly, it is the contrast of eye color to coat that makes black cats so mysterious and sometimes foreboding. The color black is already sufficiently associated with metaphysics and spiritual avenues to make a pair of gold eyes shining from a shroud of black fur seem very intimidating. For this reason, some individuals and cultures have not associated black cats with favorable qualities or good fortune. Aside from the good luck associated with owning a black cat, there are other factors that can propel potential owners towards this shade of cat. Cats are, in and of themselves, very entertaining and intelligent creatures. Black cats are no different in these aspects than their lighter-colored counterparts. However, the attractive contrast of coat to eyes that translates into such a mysterious effect will make your cat the topic of many future conversations with superstitious guests.